Our guide and driver will pick you up at 09:00 in the hotel lobby, visit Nanjing Road, the Bund, the famous avenue that parallels the Huang Pu River. The road is lined with some of the most prestigious buildings and landmarks of the city, mostly erected during the time of the foreign concessions. The river acts as a mirror between the old and the new Shanghai. Pudong features a futuristic city devoted to business and finance with its facade of skyscrapers. 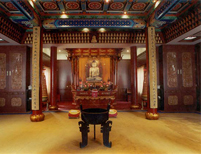 After lunch, visit Jade Buddha Temple, it is the most famous and one of the most active Buddhist temples in Shanghai. Named for its two bejeweled white jade Buddha, one is 1000kg, 1.9 meter-high figure carved from Burmese jade brought to China in 1882. The Yu Garden, it's well worth a meander through the Yu Garden, which has many scenic courtyards decorated with baroque rockery, pools and flora, all connected by corridors and passageways.